Culantro is a biennial or short-lived perennial herb indigenous to continental Tropical America and the West Indies. 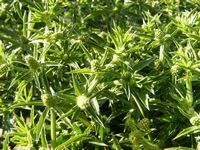 It is a small, evergreen branched biennial up to 15-20cm in height, with fibrous roots and long leaves with spiny toothed margins that grow in a basal rosette pattern. In summer numerous, tiny green-white flowers with leafy bracts, appear in cylindrical umbels. Culantro is favored in areas where true coriander (Coriandrum sativum) does not do well - it can stand hot, steamy weather. It prefers partial shade but will also grow in full sun and will do well in pots. Culantro taste similar and even stronger than true coriander (also known as cilantro) and is very popular in Caribbean and Asian cooking. The leaves are tough, but if sliced and chopped they are tasty. The chopped fresh leaves can be applied in tossed salads, soups, sauces, vegetables, curries, dips and especially fish dishes. Unlike plain coriander, culantro dries well, retains good color and flavor and it can stand some cooking. The dried leaves can be used later in salads and cooking. 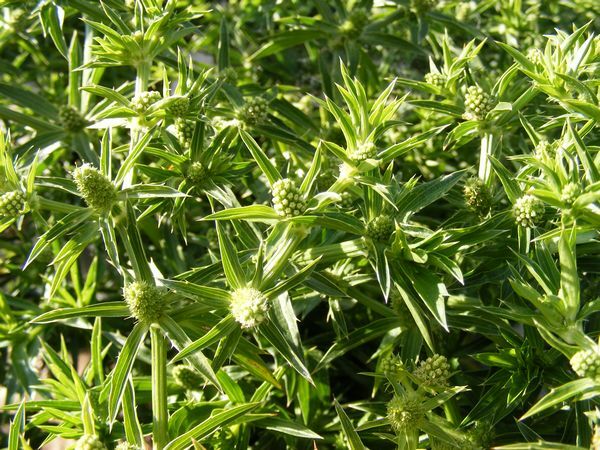 Culantro is also a good a food flavoring and seasoning herb for meat. A tea can be made to treat diarrhea, flu, fevers, vomiting, diabetes and constipation. Culantro has anti-inflammatory properties and it is rich in calcium, iron, carotene, and riboflavin.